The weight of a diamond is described in carats. The term carat originated in ancient times when gemstones were weighed against the carob bean. Each bean weighed about one carat. In 1913, carat weight was standardized internationally and adapted to the metric system. The metric carat, which equals 0.20 gram or 200 milligrams, is today the accepted standard unit of weight for diamonds and most other precious stones. 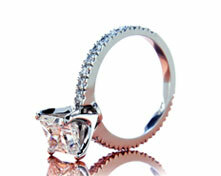 One carat also equals a little more than 0.007 ounce; one ounce equals 142 carats; and 5 carats equals 1 gram. The weight of small diamonds is frequently expressed in points, with one point equaling 0.01 carat. For example, five points is a way of saying 5/100 of a carat, and fifty points equals half a carat. To summarize, there are four general ways to express one carat - 1 ct.; 200 milligrams, 1/5 gram, and 100 points. The terms carat and karat, are often confused. Though they have similar origins and are pronounced alike, in the U.S. a carat is a unit of weight in diamonds and gemstones. A karat is a unit for measuring the fineness and purity of gold. Pure gold is 24 karat; 14 karat gold is comprised of 14 parts gold and 10 parts other metals. 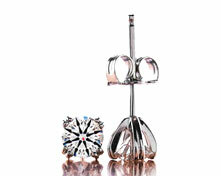 Sometimes in the jewelry trade, the term “size” is used instead of carat weight. As diamonds increase in weight, their size becomes less easy to perceive with the eye. Diamonds with a shallow cut can have a greater diameter than diamonds with a deeper cut and may appear larger than their actual weight. However, a diamond with too shallow a cut will not pass light properly and will have less brilliance than a diamond with a better balanced, more well-proportioned cut. A diamond with exceptional brilliance and fire can appear larger than its actual weight. The point here is that the appearance of size is affected by several factors and yet size and weight make a significant difference in a diamond’s price. Our experience shows that most buyers want the best value in their selection of a diamond within a certain size and weight range. A better quality cut diamond outperforms other diamonds in a wider range of lighting conditions, and produces better value for your dollar. A general rule of thumb is to look for a diamond that has a diameter measurement at least as large as the average for its weight, and select the best quality cut with a size range. That way you won’t pay for weight that cannot be seen! A well-cut and polished diamond with precise symmetry will have more fire and brilliance and give the impression that it is larger than a stone of equal weight but with a lesser cut. In the U.S., the average diamond engagement ring sold today has a weight of about 3/4 ct. A larger diamond with less brilliance will simply look flat next to a smaller, well-cut and higher-performing stone. What people notice most and what increases a diamond’s “wow” appeal is the way it transmits light back to the viewer’s eye, and that’s affected more by the cut than any other factor.